This photo was taken 3/16/04 at the sledding hill at the top of Spooner Summit. This was NOT the only dirty spot. 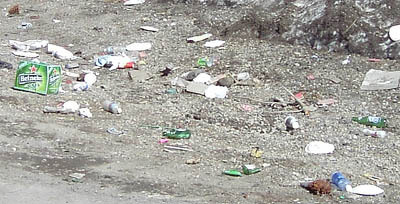 The entire road was scattered with garbage, including runoff into a nearby stream. Just don't do this! ....and oh yeah, we'll tell you where we've been, not necessarily where you should go. You, and only you, are responsible for your own decisions.